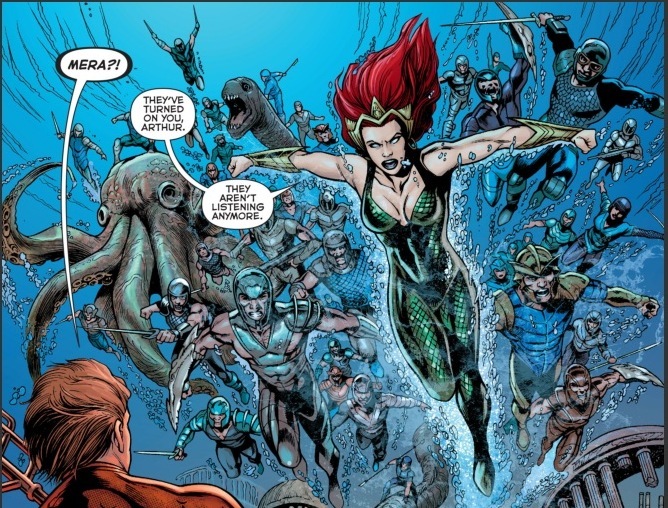 The first installment to the FUTURES END plot hits the pages of AQUAMAN this week. Shoved 5 years into the future, Aquman’s world is not the same as it used to be and he finds himself shunned as a leader by his people who are now in terrible danger. First off, I have no idea what has happened to this story-line. Jumping 5 years into the future has only tainted this once epic story. Nothing makes sense in the issue as we skip over the gap of time vaguely. It is only thanks to some internal dialogue and a few gaps being filled in by other characters that we have any knowledge of the past events. 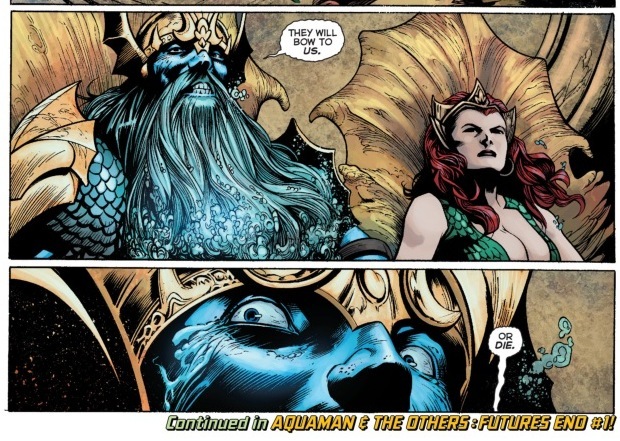 All of a sudden Aquaman and Mera are no longer the romantic couple they had been and the Sea King seems to be living on the land. I questioned almost every aspect of where the plot had gone and really wondered why this change was necessary. The rebirth of the old King from previous issues was also a huge disappointment. It felt like having deja-vu all over again with a weak excuse for Aquaman to resume his role as the underdog. So many amazing creatures or characters could have been created for this new scenario but I felt as if the team took the slack way out and just reused what they already had. 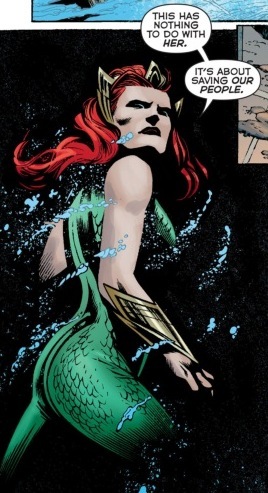 Mera really shone though in this issue. If you’re a fan of the Queen, you are going to enjoy her blunt bravery and care for the Atlantian people. 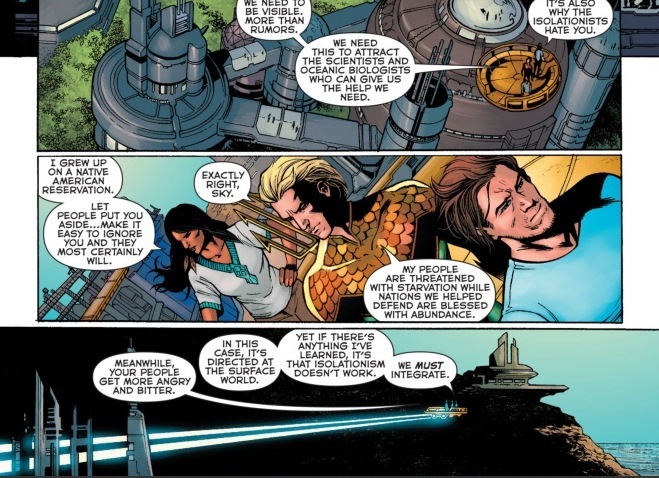 The issue centered around everyone trying to do the best they could to save Atlantis but it was definitely a case of everyone had the right answer and the rest were wrong. 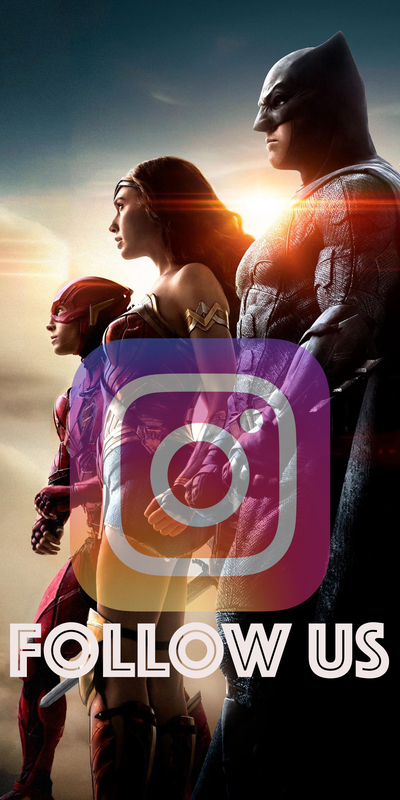 It was a mixed message that was crossed between Atlantians, the people up on the land and Aquaman’s position in the entire problem. Thankfully the artwork held onto its beauty throughout the issue as I found that the new suit for Aquaman really stole the show. It was a different twist to a classic and really complimented the change in time as well with Alvaro Martinez taking the helm on the issue. I even like the longer hair on him. As a huge fan of bold artwork, I was glad to see the heavy dose of colors onto the pages. 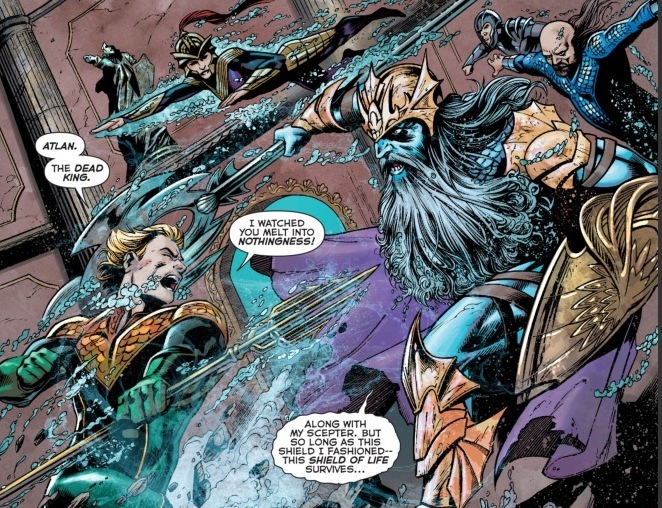 AQUAMAN is set in a fantasy land, so it’s only natural that you get that ethereal feeling especially when the Old King returns. The golden armor and blue hues to the skin really do give the characters a mythical edge and only adds to the sub-worlds nature. 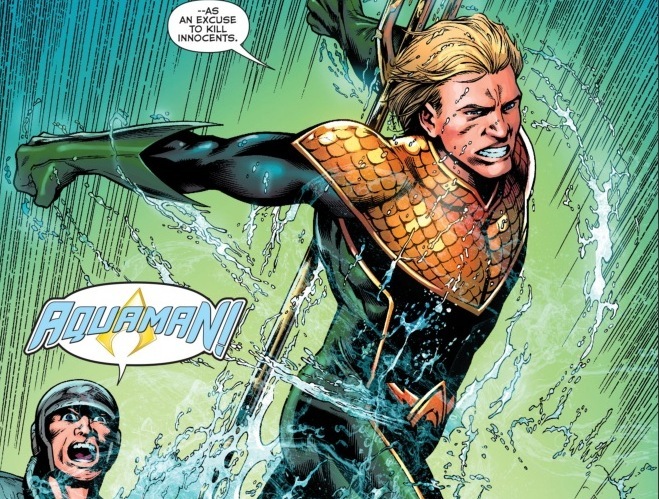 Aquaman’s suit was also an unexpected positive change. Despite the outfit changing in favor of something a little darker, elements of the original were still very obviously Aquaman. 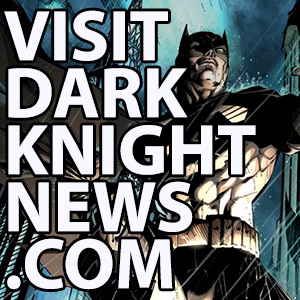 With a confusing story-line and a returned old foe, the issue really didn’t have the excitement factor this week. The FUTURES END plot line alone let the comic down and I was highly disappointed with the lack of explanation as to the events that had passed. There was too much text about nothing in particular and not enough about the events surrounding the failing ecosystem of Atlantis. Even as the story continued it still jumped from scene to scene with panels being crammed into pages in an effort to explain at least something small about the last 5 years. I had really been enjoying the clever writing for AQUAMAN until this issue. 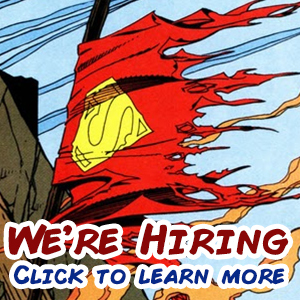 I feel like DC have really dropped the ball with this change and really didn’t know where they were taking this idea for all of the comics in the FUTURES END saga. With the future of Atlantis now in the hands of a dead tyrant, the next issue of AQUAMAN might be history repeating itself. The change to time will definitely play a huge factor in the story from here on out so stay turned and hopefully some answers will be coming very soon.